Caption: Proud to stand by fellow solidarity fasters Mara Keisling (National Center for Transgender Equality), Rep. Mark Takano (D-CA), and Rep. Sean Patrick Maloney (D-NY), and Sharita Gruberg (Center for American Progress), along with our friends at NCTE and CAP. Today, I am not eating. Not because of the latest diet fad, or because I can’t find organic vegetables. I’m fasting for a cause I believe in- common sense immigration reform. I’m joining the #Fast4Families for a one day solidarity fast, along with activists from LGBT AAPI communities around the country. NQAPIA board members, staff, and partners are joining over 500 solidarity fasters from AAPI communities to push Congressional action on common sense immigration reform. Tell Congress to act on common sense immigration reform, and raise your voice for the families that want to stay together. Congress remains stuck in partisan bickering, but we need them to act now. Our families across the country are waiting for a decision and can’t afford to wait any longer. So we’re following the footsteps of human rights leaders like Mahatma Ghandi, Dr. Martin Luther King, Jr., Cesar Chavez, and now, sadly enough, Nelson Mandela who are no longer with us, but who energized their communities by fasting as protest to push for justice. 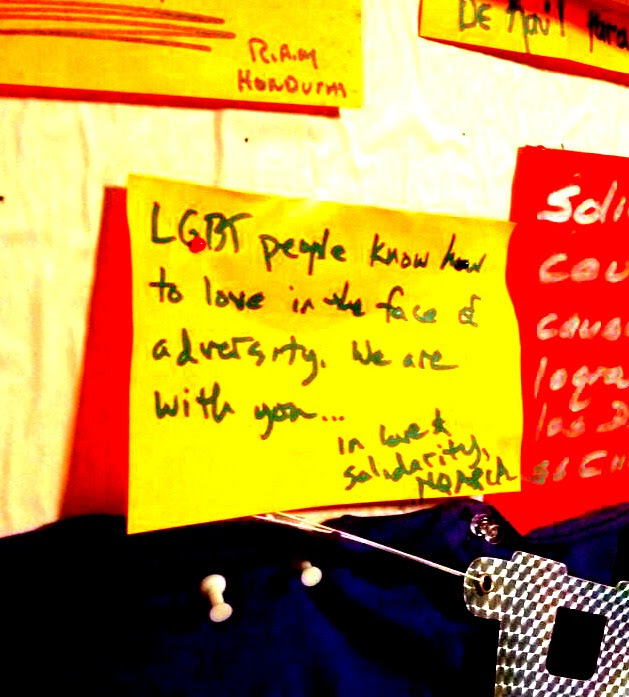 The note I left with the fasters says it all: “LGBT people know how to love in the face of adversity.” That’s why we #Fast4Families and bring our bodies and whole selves to the struggle. Next week is your last chance to contact Congress before the end of this year’s session. Add your voice to the chorus calling for immigration reform. Fasting will not be easy, but I need to do this for our community. And I know I’ll find strength when you join me in demanding justice for LGBT AAPI immigrants and all our families. P.S. Looking for another way to support our fast? Please donate $10 today by clicking here. Pabitra Benjamin shared her thoughts about the NQAPIA hill drop and delivering over 2,700 postcards calling for commonsense immigration reform. Add your voice to hers and tell the Congress to pass immigration reform this year! I’ve just spent two amazing days on Capitol Hill talking to actual members of Congress about immigration reform from a perspective they NEVER get to hear. As a South Asian queer advocate, my perspective is at best ignored, and at worst, vilified. Being told that “immigration is a Latino issue,” or “Deportations are too tough an issue to talk about” weighs heavily on me as I fight for the needs of my community. Having lawmakers listen to our communities’ stories and the issues we care about such as family reunification, protecting workers’ rights, providing health care for immigrants, and stopping arbitrary deportations and detentions on our terms has been nothing short of inspiring. There is perhaps no more important time for these conversations to happen. As we approach the holidays, the window is closing for the Congress to act on enacting real reform that provides relief for our communities and our families. Will you join me in telling the Congress that our stories matter and demand immigration reform for ALL our families before the end of the year? Speaking with the members of Congress gave me valuable insight on the challenges we face, but also the opportunities we have to have real impact. Rep. Judy Chu (D-CA) is the chair of the Congressional Asian Pacific American Caucus and Rep. Jared Polis (D-CA), her counterpart in the Congressional LGBT Equality Caucus, heard us loud and clear as immigrants and family members who are both AAPI and LGBT. Calling them to account for our communities is not just an exercise in democracy, but a testament to the power we can wield as a community. In the next few weeks, lobbyists on all sides of this issue will bring their slick messaging and glossy presentations to the Hill as the heat turns up on the immigration debate. For us, our most powerful tools we bring to the table are the compelling stories of real need in our communities for real change. Seeing the eyes of a Congressmember light up when they heard our real stories, I know this to be true now more than ever. Tell your member of Congress that all our stories are important and that they need to pass commonsense immigration reform now before it’s too late. P.S. Learn more about our communities in NQAPIA’s Uncovering Our Stories series.